If an individual student is no longer with your studio, you can change their status to INACTIVE. This keeps the history of the student including billing and class enrollment but it removes their name from the active class list. You can also make a group of students inactive if they are not enrolled in a class all at one time: see Make Student Inactive by Season. To make a student inactive, hit EDIT on the student. In the status field, change the status to inactive and hit update to store the change. Once a student is made inactive, you can access them from the Inactive Student Menu. GO to Student menu and select Inactive Student from the left side menu. 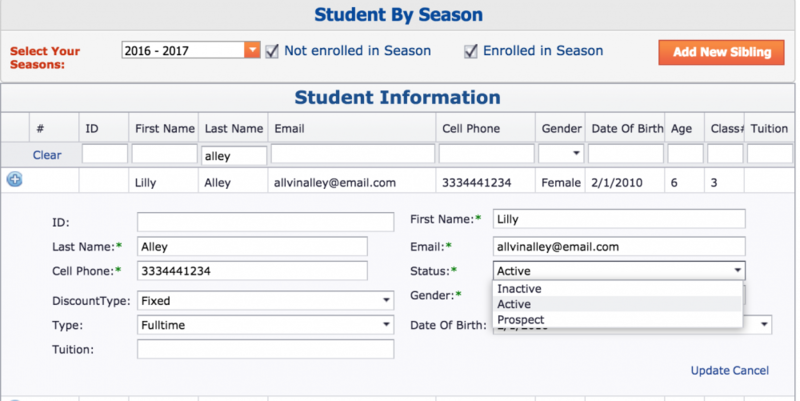 Select Inactive Students by Season. Select All Inactive Student to bring up ALL of your Inactive students. You can make a student active even after they have been made inactive. You would do that by clicking edit on the student and change the status from INACTIVE to ACTIVE. That student will then appear in the active student list.